Hi, I am interested in your 1989 Chevrolet Camaro (stock #5123-CHA) listed on Autotrader for $15,995. I'd like to get more information about this vehicle and confirm its availability. A 1989 Chevrolet Camaro IROC Z/28 finished in a full midnight package really has a cool look. 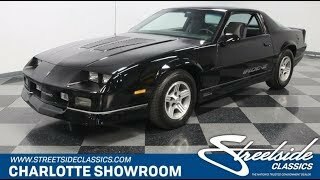 But when you realize that this loaded sports car also has a rare stick-shift, then you know you found the affordable classic Camaro youve been searching for. This is a factory black car, and it was given a professional respray later in life to keep it looking glossy. And thats exactly what you want on this generation Camaro. When the sunshine hits the straight sheetmetal, it really shows off the angular style. And as the light roll across the body it reveals some of this Z-cars coolest features, like the hood inserts, factory ground effects, and nicely integrated rear spoiler. While these modern classics dont carry chrome, there is a nice silvery glow to contrast the black on everything from the IROC stripe package, to the 16-inch alloy wheels. It makes for a striking total package. Inside, theres more thoughtful care in this highly correct interior. You see plenty of well-preserved originality in the two-tone gray seats, taut door panels, and plush carpeting. This one came loaded from the factory with power locks, remote rear hatch release, tilt steering, factory AM/FM/stereo, and cruise control. Plus, the air conditioning has been upgraded to R134a to keep you feeling nice and cool. Youll love how the three-spoke steering wheel gives you a commanding view of the gauges, including the large speedo and very important tach. The engine bay looks just as nicely presented as the rest of the car. Good maintenance of the essentials is combined with carefully preserved components (even the factory decals are still bright!) But we know you want this for more than just for its preservation. The 305 cubic-inch fuel injected V8 is a great power package for reliable delivery and tons of torque, and this one is believed to be original to the car. Best of all, you have complete control over it thanks to the five-speed manual transmission a true rarity in these 3rd gen Camaros. It even has its clutch replaced a few months ago, so you can enjoy this stick-shift to the fullest. Plus, this is a great total package with power steering, front disc brakes, anti-lock brakes, and sway bars front & rear. Complete with owners manual and warranty card, this is the well-presented classic that represents its era perfectly. So at a price like this, you know you need to hurry on this IROC-Z. Call now!